Yes, that's our spot! Bear Patch occupies part of "The Parenteau Building", one of the oldest buildings in our downtown. In the picture above, you can see the same basic structure that exists now. At that time, the door was clear over to the right of the picture, on the corner. That was moved and replaced with windows. If you look at the front of the building, you will see one little door between the front windows. That's an entrance to the apartments upstairs. Our current entrance was built just to the right of that little door in place of that large window. To the left, by the telephone pole, is the Sewing Center entrance. To the left of that is a building that now houses a karate studio. 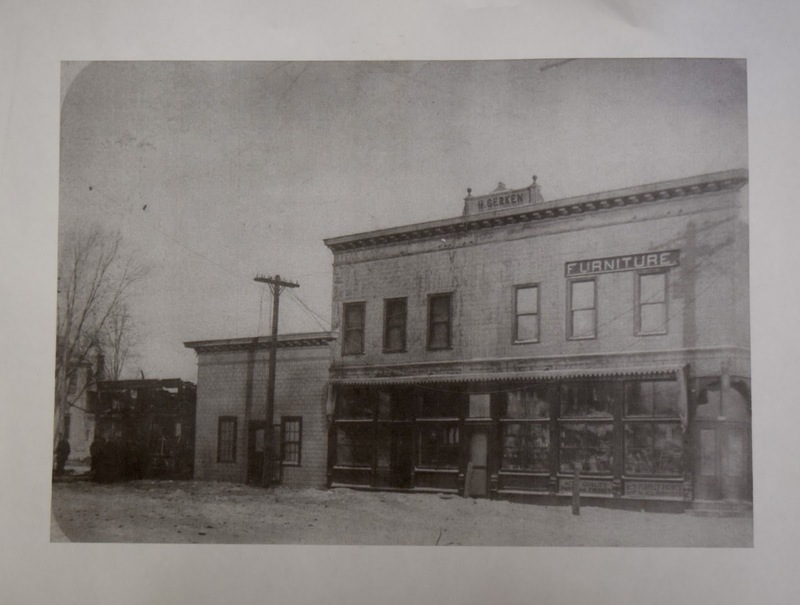 Here's another vintage photo of the building, thanks to White Bear Lake Area Historical Society. It looks more like our current store front. There have been a lot of businesses in these shops, and they are all interconnected. If you walk across our shop floors, you will notice the creak and squeak of the original boards. It's a real challenge to keep something that old in working order, so sometimes things don't work like they are supposed to, but we work around it. We love our location in the middle of a community that feels like a small town. We can walk just a block or 2 and find just about anything we need. Several options for food and beverages, too! I don't know the entire history of the building we are in, but I do know that some of the businesses that have occupied the space are: variety store, men's clothing store, furniture store, livery stable, wedding accessories store, Native American gift shop and shoe repair shop. And apartments upstairs, still in existence. So we have quite a history! One problem that we have always had with the store is temperature control. The heating system was an ancient big boiler in the basement. During the cold months, one of us had to go down to the basement at least once a day, sometimes twice depending on the weather, and manually open a valve to fill the water tank. If the system ran out of water, we lost all heat, and it took hours to get it back up to steaming through the radiators. When we lost heat, the residents of the apartments upstairs did, also. That boiler replaced a year or 2 ago by a new and much smaller boiler system that fills itself! Amazing! During our all-to-brief summers, we do get some hot and humid days. We would like to have our doors open most of the time, but then we have problems with creatures. Besides the everyday wasps and bees, flies and gnats, I have seen (and helped remove) a squirrel and a bat! We have had 3 wall unit air conditioners high up on one long wall of the store for a long time. They worked and worked to keep us cool, but were often inadequate. That makes for an uncomfortable experience for our customers wanting to spend some time shopping or taking a class. And you might know how all of us ladies of a certain age do not enjoy any added heat to our environment! Layering was mandatory if you worked at Bear Patch! Well, we are looking forward to a whole new experience this summer, thanks to our business owners! We now have 2 of these units installed, with a lot of messy labor to get all the necessary lines in place to make them work. But the result is fabulous! Even though it's not hot hot yet, they are maintaining lovely dry, cool, fresh air for us! It's a miracle! I don't know much about HVAC, but I do know that we would not have this if it weren't for the fact that Debbie and Bob's son, Andy, is a heating and cooling specialist and owns a company that keeps people comfortable -- AR Engh Heating and Air Conditioning in Cokato, MN. It's good to have people!